Compartment Pressure | The Secret to Preventing Impact Injuries? Upon haring the words “compartment pressure” – what comes to mind? A majority of us may think of exertional compartment syndrome in runners or possibly compressive garments. Today’s blog is going to explore how our body – particularly the foot and lower leg – uses compartment pressure to efficiently transfer forces. After researching the concepts I am about to discuss with you, my approach to overuse injuries and my Podiatry practice as a whole has changed! It’s as if I look at injuries through a different lens. Before we delve deeper into the concept of compartment pressure, we must first review a few key points which lay the foundation to impact and movement efficiency. I decided to do it in a step-wise fashion to make it easier to understand. These impact forces are designed to provide the kinetic energy to walk, run, dance etc. As impact forces enter the body our soft tissue (muscles) respond to stop or damp the entering vibrations by contracting isometrically. The concept of loading through isometrics is a new concept so let me give you an analogy to better understand this. If you imagine a tuning fork vibrating upon impact it will vibrate at a certain frequency. To stop the vibrating tuning fork one must either touch it or put it against something. Putting pressure against the tuning fork is analogous to the isometric contractions of our lower leg upon impact. As the muscles contract isometrically the fascia and tendon fibers slide thus allowing the joint range of motion needed for ankle dorsiflexion and STJ eversion. As the joints flex elastic energy is being stored in the fascia and tendons. As we shift from late midstance to push-off the fascia and tendons release this stored energy swinging the leg forward into swing phase. So where does compartment pressure come in? And what even is a compartment? A compartment is a group of muscles that are surrounded by a sleeve of fascia. Muscles within a specific compartment are often innervated by the same nerve and supplied with the same artery. 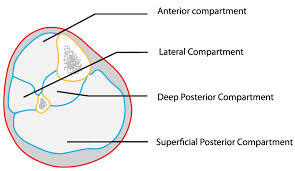 In our lower leg we have 4 compartments: anterior, lateral, superficial posterior and deep posterior. In our foot we have 9 compartments! As our muscles contract (especially isometrically) compartment pressure and stiffness begins to increase. The degree of pressure or stiffness is dependent on the rate at which the muscle fibers contract as well as the number of fibers recruited. How does this affect the loading response? Well all compartments respond to vibrations of different frequencies. Walking impact force frequency is 15 – 20 Hz which is also the frequency at which the lower leg muscles contract. The goal upon foot contact – regardless of the movement – is to match the stiffness in the compartments to that of the incoming impact forces. Any delay in creating stiffness or compartment pressure can result in an increased risk of injury. I’ve begun to look at overuse injuries – particularly running injuries – with this concept and a clear association exists between delayed or inadequate compartment pressure on foot contact. How can you begin to apply this concept to prevent impact injuries?